When the California Lincoln Dealers asked us to help launch their 2011 Lincoln MKX, we were excited. But when they approved our concept, we were thrilled! The basic formula: road trip through California with bi-lingual actress/model Vane Millon, connecting with dozens of unique local businesses. The twist? 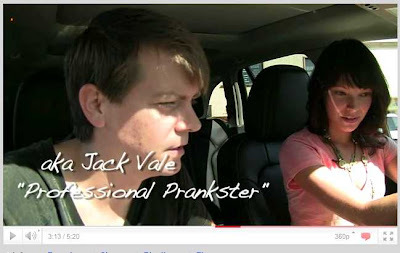 An unlikely partnership with one of my favorite YouTube pranksters, Jack Vale. Known for outrageous “pooter”, “ugly face” and “old man” pranks, it was an unlikely partnership, to say the least. But the real challenges lay ahead. Could we successfully prank Vane, while filming our more "traditional" road trip? If so, how were we going to do it? Could we keep it secret? And if so, for how long? Here's the trailer that we recently launched, teasing the campaign. Her reaction at the end was priceless. Based on her reaction, I'd say we successfully pranked her. To kick things off, we decided to position Jack as the winner of a mock Facebook Sweeps in which one lucky Sacramento fan was awarded a single city ride-along with Vane. Posing as an ordinary fan (and calling himself Jack Sutton), we accomplished step one of the prank, without a doubt. Vane bought it. And we made the introduction on the first leg of our journey. Um...Why are you making that face?! “Don’t worry, it’s gonna be really routine,” I reassured Vane. “Just tell Jack a little bit about Sync, MyLincoln Touch and maybe throw in something about the heated and cooled seats, and we’ll be off to the next stop.” The crew and I exited stage left, pretending to set up for the next scene and left her with Jack. The "routine" demo turned out to be anything but. We can't give away too much, as we're still rolling out the webisodes, but heres a quick snippet that Jack just posted on his YouTube Channel. Pretty priceless reactions. If you want ring side seats to the whole thing as it rolls out, feel free to visit, like and subscribe the following pages. Also, I’ll be updating the blog as it rolls out.